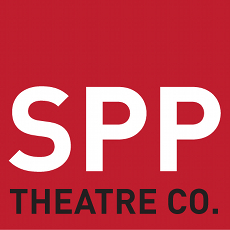 In 2015, after 61 years, St Paul's Players (Southville) rebranded as SPP Theatre Company. We have performed at many venues around the city, taking our reputation and skill with us. Bristol BS3 1HT (junction of North Street & Dean Lane), starting at 7:30. We meet in an upstairs room, but will be in the bar beforehand. We will be looking at items for our next production (late September/early October) which should be a selection of monologues, duologues, short plays on a theme, probably love. We have some that we can look at, and are looking for people to take part. All welcome, members and potential members, so please come and meet us. 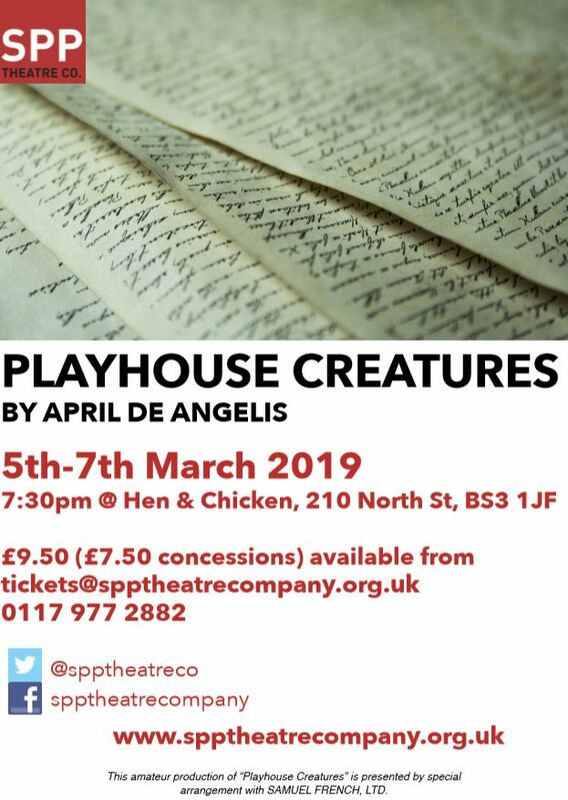 was performed 5th-7th March 2019 at the Hen and Chicken, North Street, Bristol. This Alan Ayckbourn one-act play was entered at The Bristol One Act Festival 2018 on February 21st where new member Stephen Jewell gained a nomination as Best Supporting Actor. It was also entered at the Avon One Act Festival 2018 on March 10th where Peter Irwin gained a nomination for Best Actor, and we were nominated for the Technical Award for set and props. It was finally performed on March 15th at the Hen & Chicken, Bedminster, followed by a social evening on March 19th at the same venue when we welcomed some prospective new members. We entered "And Go to Innisfree" by Jean Lenox Toddie, directed by Christine Sargent. "Time of my Life", by Alan Ayckbourn, was our full-length production in September 2016. 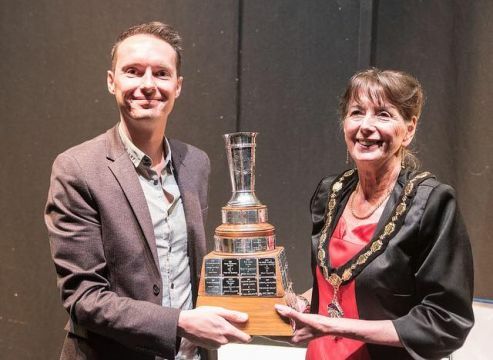 We are delighted to announce that "The Arrangement", by Toby Rome, won the Geoffrey Whitworth Award for best original script in the 2016 Avon one-act festival, performed at the Backwell Playhouse. Jo Cross was nominated for the best actress award. Toby is one of our more prolific writers, and was awarded second place in 2014 with "Twenty Twenty" at the same venue. See photo at lower left of Toby being presented with the trophy by the Deputy Mayor of Cardiff, where the final was held. This was held on Friday March 18th in St Paul's Church, Coronation Rd, Southville. The evening opened with a repeat of "The Arrangement" by Toby Rome (see above). It was followed by the first Bristol appearance of The Second Majors Beer Band, Joe Marsden's new project, playing Bavarian Oompah style covers of modern classics. The evening ended with a reading of one of Christine Sargent's excellent monologues, followed by a rehearsed reading of "Her Tongue" by Henry Arthur Jones. Click here to download a spreadsheet listing copies of play scripts which are held by the group. To borrow a copy please contact Steve Andrews, email andrewssteve54@gmail.com.